This past weekend I had the exciting opportunity to begin our new classes involving the Upper Cle Elum River and Cooper Lake fly fishing courses. Unfortunately Mother Nature decided to "rain on our parade" so to speak, handing us some liquid sunshine and less than desirable summer time temperatures (welcome to fishing in the high alpine Cascade region!) So don?t forget to pack some rain gear no matter what the meteorologist may say. Nevertheless, it was still a fun and excellent experience for guide and angler alike. On Saturday I taught the Upper Cle Elum River Walk and Wade class. We headed up Highway 903 through the sprawling metropolises of Roslyn and Ronald towards Salmon La Sac, stopping near the Cooper Bridge to introduce the basics of the course and describe general areas to access the river along the paved road. We than headed into the ?wilds? driving up the Tucquala Lake Rd. 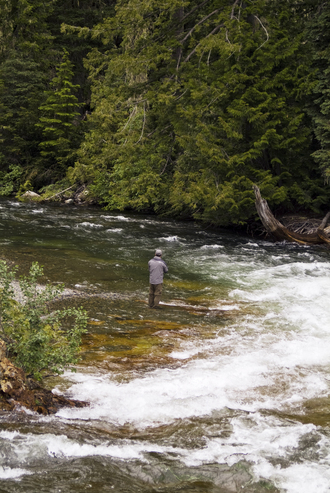 stopping at a plethora of spots on the Cle Elum River. Access to the river, it should be noted can be limited by private property, so pay attention to where you stop and be certain it is public before you head towards the river (don?t worry it is usually well marked.) Despite the sporadic appearance of actual sun and the more prolific appearance of rain and clouds; the overpowering beauty of the river really can put into perspective the diversity of fishing styles we have in this county. The river is still a bit high at this time of year, especially with the recent rains. Wading can be difficult with the speed the water is moving so I would recommend a wading staff and good sturdy wading shoes/hiking boots if you plan on exploring this region. It was a really exciting experience and a chance to see some areas this county has to offer outside the infamous Yakima. On Sunday I made the short jaunt from the Upper Cle Elum to Cooper Lake to instruct our Cooper Lake/Stillwater Tactics course. Again Mother Nature decided to be fickle and hand us some overcast drizzly skies and chilly air temperatures. Along with this, the recent rains have clouded the lake's normally crystalline water, which made fishing a bit tough. We persevered, however, having the most success with either trolling or strip retrieving buggers, leeches and Dali Llama's. If you have not been to this lake I must say you are missing out on one of the truly most beautiful places in the state of Washington and the fishing is more often than not, stellar. A personal flotation device is required for this course, float tube, kayak, pontoon or drift boat all work. No motors are allowed on the lake however, so keep that in mind. The course covered different stillwater tactics, such as the strip retrieve, finger roll, chironomid setups and of course trolling. Despite the weather it was still a great experience and one I look forward to repeating in the future. Due to the weather fishing was a bit slow, but the multitude of different fishing situations on this truly wild river is absolutely limitless. We caught some fish in the average size range for this river which is 6-10 inches. 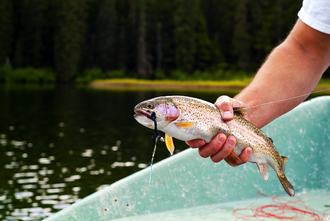 The typical Cooper Lake fish is going to range from 12-15 inches with some ranging to "trophy" size (and yes there are Brown Trout, but Rainbows are going to be the most common catch). We've found that the strip retrieve of buggers, leeches or the Dali Llama is the most effective way to catch fish from this gorgeous fishery. Thus concludes my weekend report of traipsing through the backwoods of the Upper Kittitas County. We are offering these two courses along with other Upper County adventures throughout the summer. Including these exact same courses July 26th and 27th. If you have any interest in joining myself and Red's Fly Shop in any of these off the beaten path classes or fisheries feel free to contact us! For what its worth, I fished up there today and it was "ok". The river is a tad high and made it tough to move around. Look for this to seriously heat up in about 2-3 weeks! Had a great time and learned a lot. I'm fairly new to this fly fishing and really appreciate the time all you at Reds take to explain our questions. I will definitely take another class like this.